Welcome to River Custom Canvas ! Spring is in the air and we are geared up and excited for the 2019 boating season! Our shop is located at 40616 Marina Road, Clayton, NY 13624 and is focused on serving customers in Clayton, Alexandra Bay, Cape Vincent and surrounding areas in the Thousand Islands. Early season hours are typically by appointment so its best to call to make sure we are in the shop before stopping by. Please contact us at 315-480-5885 to discuss a project and to get on the 2019 calendar. 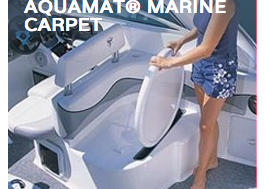 In addition to complete canvas fabrication, We also offer a full line of marine flooring in both custom snap in AquaMats and also Infinity Luxury Woven Vinyl. River Custom Canvas is proud to be a member of the Clayton Chamber of Commerce and the Marine Fabricators Association.